As a young man Sándor Csoma Korösis' great ambition was to find the ancient homeland of the Hungarian people. He never achieved this goal. However, he would still become world famous for introducing the language and culture of Tibet to Europe. He was born on in the Korös community of Transylvania. He began his studies at the Nagyenyed College and was sent to Göttingen in 1815. There he studied Asian languages. In November of 1819 his travels began. He arrived in Teheran in 1820. He studied there for 4 months. He then joined a caravan thru Afganiztan bound for India. In 1822, he arrived in northwest India at the headquarters of the Lakakhi Kingdom. However, from here, because of the risky and volatile atmosphere, he was unable to continue his pilgrimage to East-Turkistan where he believed he would find the homeland of his ancestors. He met with an English official who convinced him to study the Tibetan language. He accepted this challenge hoping that in the Tibetan Llamas libraries he would find the origins of the Asian people who were the ancestors of the Hungarians. From 1822 to 1830, Korösis, while living in different monasteries, learned the Tibetan language, history, and literature as well as Buddhism. In 1831, he went back to Calcutta, where he worked in the Asian Society Library for 2 years. During that time he prepared his fundamental work. The Tibetan Grammar and Tibetan-English Dictionary were issued in 1834. In 1842 Korösi again traversed Tibet in a northern direction hoping to find the ancient homeland of the Hungarians. He did not get very far. He contracted malaria, then incurable, and died in the Himalayas near Darjeeling. His tomb with inscriptions in both English and Hungarian can still be seen. 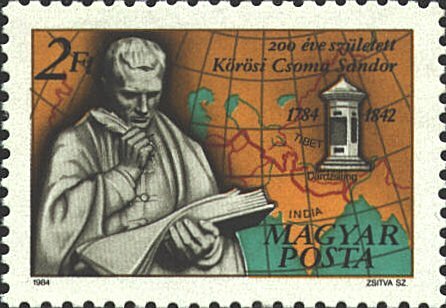 The stamp was issued in 1984, the 200th anniversary of Korösi’s birth. It shows a map of the Indian sub-continent and Korösi’s route.